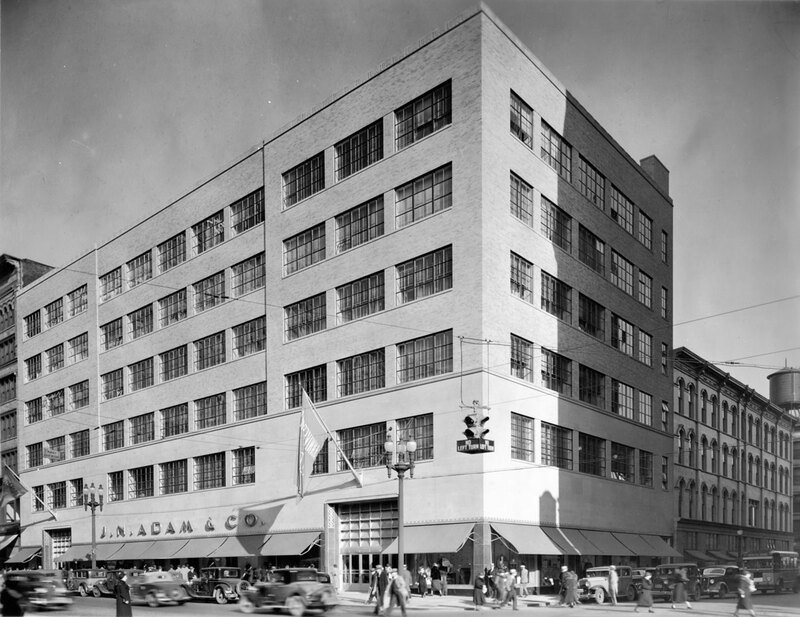 The J. N. Adam & Company department store, expanded and modernized, reopened with fanfare in 1935. The above copy from a 1935 newspaper ad captures a local spirit, even at the height of the Depression, of civic optimism. The store expansion was designed by Starrett & van Vleck, America’s premier department store architects in the early 20th century. Reminiscent of Erich Mendelsohn’s department stores in Stuttgart (1928) and Chemnitz (1929), it was Buffalo’s first hint of the emerging International Style. In 1960, the building became the home of AM&A’s, perhaps Buffalo’s most beloved department store. The building went dark in 1998, evaded an ECIDA demolition and redevelopment attempt in 2005, and was purchased in 2015 with plans for a mixed-use rehabilitation.